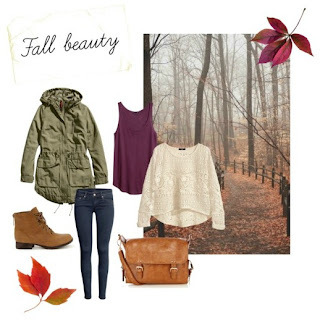 This is just a little something I threw together on Polyvore recently. H&M have some really nice pieces in at the moment so I put a few of them together (my Polyvore is slowly but surely becoming a bit of a H&M wish list). I started out with this beautiful lace top/jumper. It's such a delicate piece and is absolutely perfect for layering up with vest tops like this burgundy one. I added in a pair of dark 'super skinny' jeans to balance out the loose tops, and this lightweight parka to add a bit of an edge to the outfit. I also added in these boots and satchel, opting for tan rather than black to keep the look soft. Fingers crossed I find the time to stack up a few posts this weekend, but in the mean time I hope you're all well and enjoying the crisp weather.